João Pedro Soeiro de Matos Fernandes was born in Águeda, in 1967. He graduated in Civil Engineering from the Faculty of Engineering of the University of Porto in 1991 (option: Territorial Planning) and completed his Masters in Transportation at Instituto Superior Técnico, Lisbon, in 1995. Between 1990 and 1995 he worked in the Commission of Coordination of the Norte Region (Territorial Planning), being the coordinator of the transport sector. He was Deputy Secretary of State for Natural Resources between 1995 and 1997 and Chief of Staff of the Assistant Secretary of State for the Environment Minister between 1997 and 1999. He was Administrator of Quarternaire Portugal, Consultoria para o Desenvolvimento, SA between 1999 and 2005. 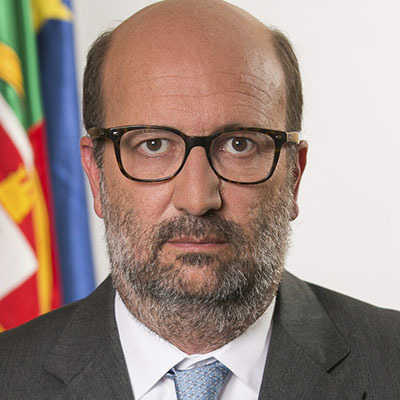 He was a Member of the Board of Directors of Douro and Leixões Ports between April 2005 and May 2008 and Chairman of the Board of Directors of Douro and Leixões Ports Administration between April 2008 and May 2012. He was Chairman of the Board of Directors of the Port Administration of Viana do Castelo from its inception (January 2009) until May 2012. He was President of the Portuguese Ports Association between April 2008 and April 2010. He was a lecturer at the Instituto Superior Técnico (Infrastructures) and the Instituto Superior de Transportes (Energy and Environmental Impacts of Transport). He lectured as a guest in master's degrees at the University of Porto, and at the Technical Universities of Lisbon and Naples. Has gave numerous public lectures as an invited teacher in the area of ​​Transport, Infrastructures and Territory. Between June 2012 and December 2013, he was an advisor to the Board of Directors of the companies Terminais do Norte and Portos do Norte (Manica Group), assuming management functions of the Port of Nacala, in Mozambique. He was Chairman of the Board of Directors of Águas do Porto from January 2014 to November 2015. He is Minister of the Environment in the XXIth Constitutional Government of Portugal since November of 2015.